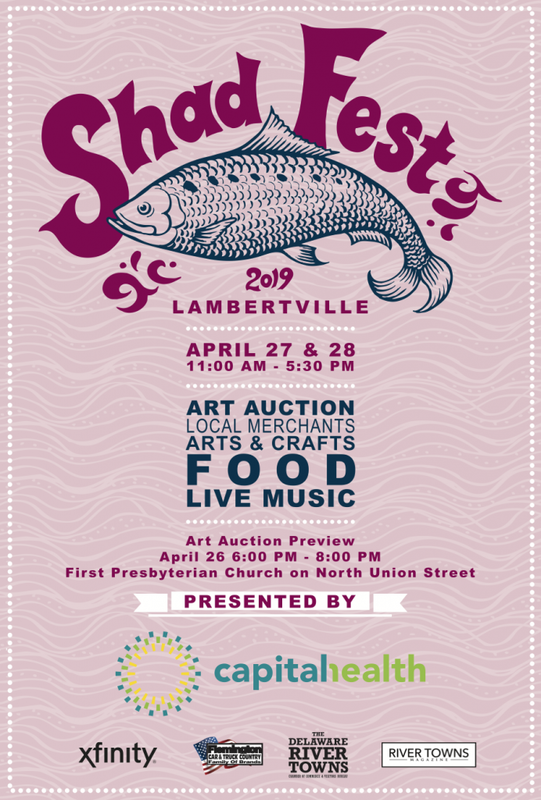 Our family of brands will proudly once again sponsor & take part in Shad Fest, which will take place this year on Saturday April 27 & Sunday April 28 from 11 am to 5:30 pm in Lambertville NJ! In its 38th year, Shad Fest 2019 will feature more than 22 original works of art on display that were created & donated by local artists. They’ll prominently be on display at the First Presbyterian Church’s recreation room, located at 31 N. Union St. There will be an art auction reception & preview taking place on Friday April 26 from 6-8 pm at the church where you can meet the artists, get a head start on bidding and enjoy light hors d’oeuvres, music & entertainment. The auction will take place at the festival on Sunday April 28 at 3 pm, with all winning bids being donated to the Jim Hamilton Shad Festival Scholarship Fund for students pursuing higher education in the arts. Local merchants will also be on hand with featuring jewelry, ceramics, furniture, apparel, accessories, home décor & more. Family fun can also be had in the form of face painting, sand art and more children’s activities. Flemington Car & Truck Country will be part of Shad Fest 2019 and will be giving away FCTC reusable grocery bags & other trinkets along with a $300 event coupon. Each of our family of brands will be represented at the event and some of our most popular vehicles will be on hand for attendees to take a look at, learn about and take photos with. We hope to see you at Shad Fest 2019!